Tandem Skydiving is the fastest, easiest way to experience freefall, life’s ultimate thrill. Experience it without the intensive training, or responsibility of opening your own parachute. Beach skydiving just 40 minutes from Perth CBD! 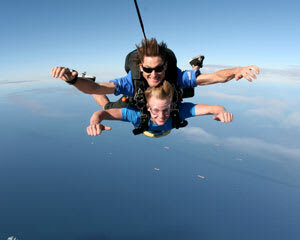 You can now enjoy the closest beach skydives to Perth CBD, just a short drive away in Rockingham. Soak up the most spectacular views of the of the beautiful Shoalwater Islands Marine Park including Penguin Island, Cockburn Sound, Garden Island and all the way out to Rottnest Island. Freefall from up to 15,000ft above the stunning coastline for up to an insane 60 seconds, then float back to earth under canopy, touching down in our beautiful beachside drop zone. Your highly experienced and friendly staff are dedicated to ensuring each and every customer has an unbeatable experience, and with awesome digital stills and video package available to purchase on the day, a Rockingham beach skydive will be one to remember forever! Survived the jump would do again in a heartbeat.staff were lovely happy helpful and full of knowledge..
That was the most awesome experience ever, I just wanna do it again and again and again and again.... I think there may be some serious addiction going on, hahaha!! A tremendous experience in the hand's and care of a very competent instructor. Thank you Dave. This was the most amazing experience I have ever had. Will certainly do it again.